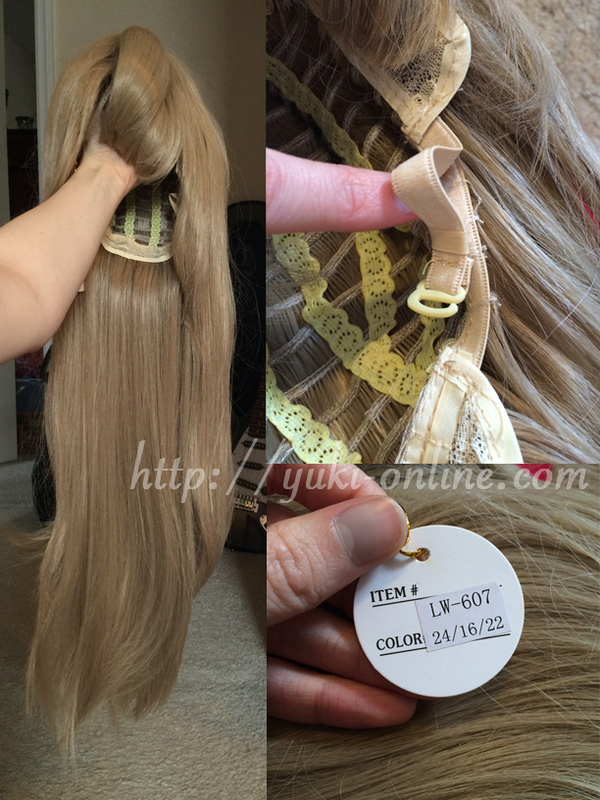 EDIT: Added info about how to wear the wig, just after the wig information. The first payment consists of the cost of the items, domestic shipping, and Taobaospree’s service fee. In this case, it came to $163.91 USD. I paid the evening of January 23, right after I got the email that my bank had transferred the funds. Unfortunately, it was the weekend in China, so I got an auto-respond email back saying that they would return Monday (late Sunday my time). 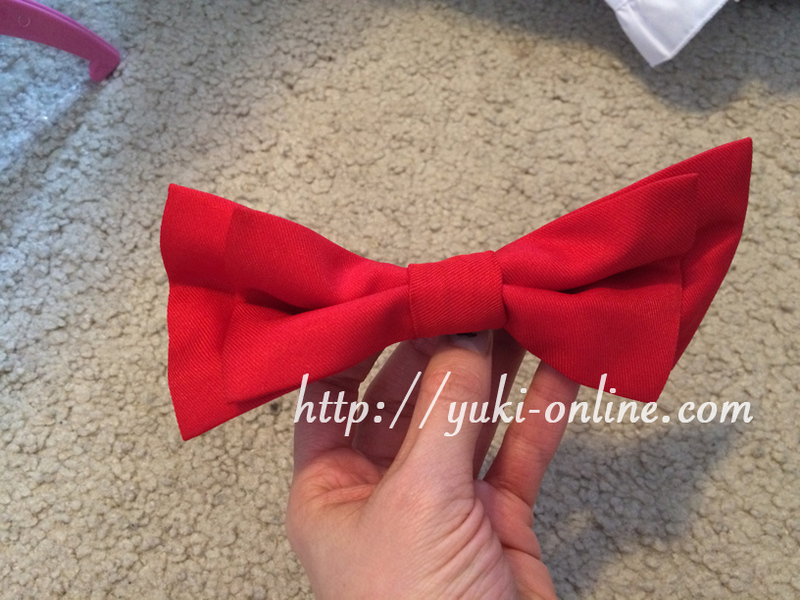 Feb 4 – Ray replied with photos of the items and other information. I paid the second payment, which came to $58.23 (cost of EMS). Later that evening, Ray informed me that my package had been mailed! 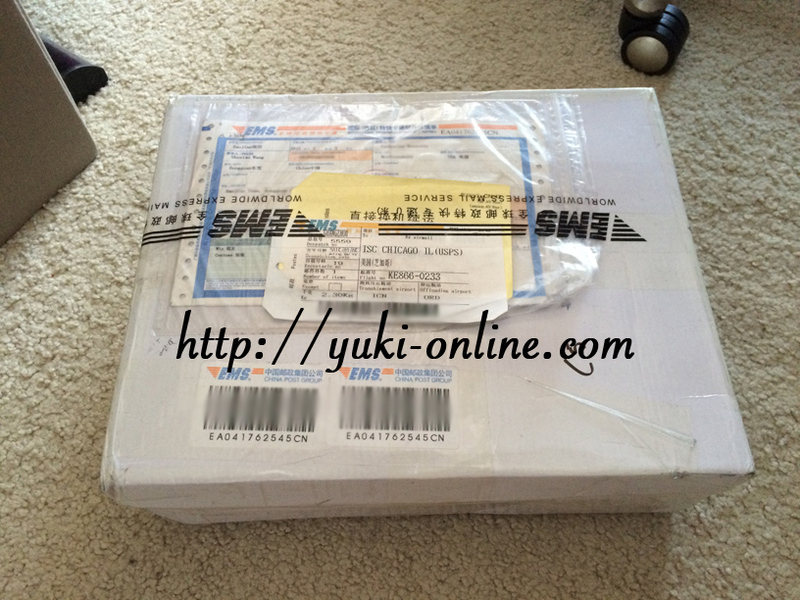 Feb 11 – package arrived (It literally took one week!) 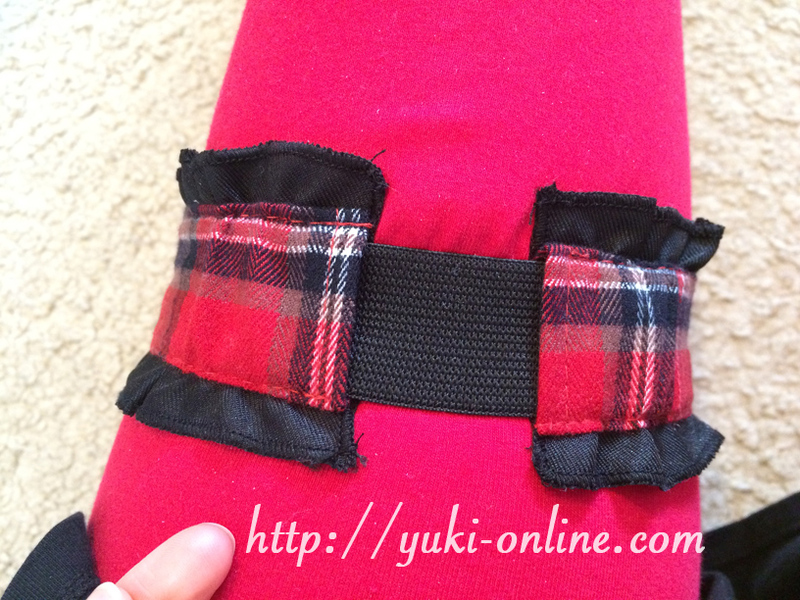 I was amazed that it came so quickly, because Ray said it usually takes about 10-20 workdays. I think 2 was a special number or something xP $222 and 22 days from order placement to arrival? 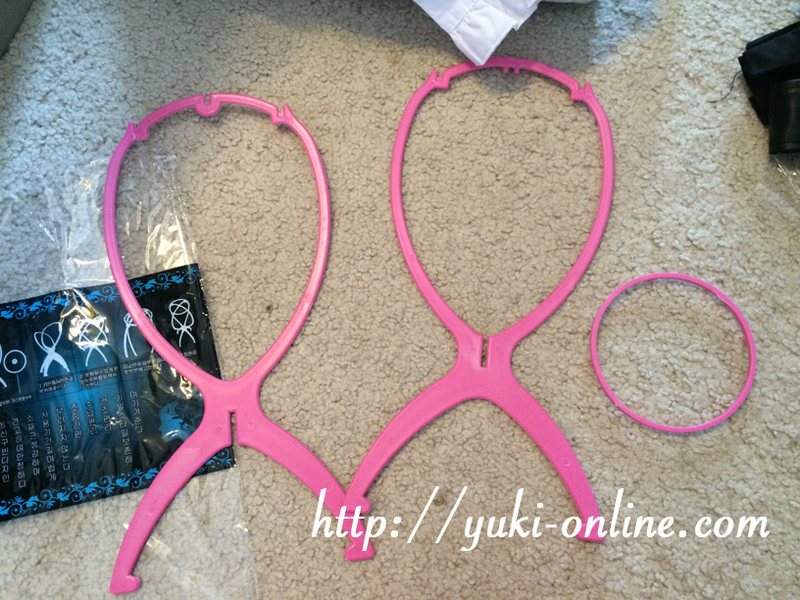 Anyway, I was extremely pleased with Taobaospree and their quick responses and willingness to help. I definitely recommend them if you are looking to buy from Taobao and want to use a service you don’t have to be afraid or suspicious of. Order form: http://www.taobaospree.com/order_form.htm I don’t have Excel, so I just emailed them the info. 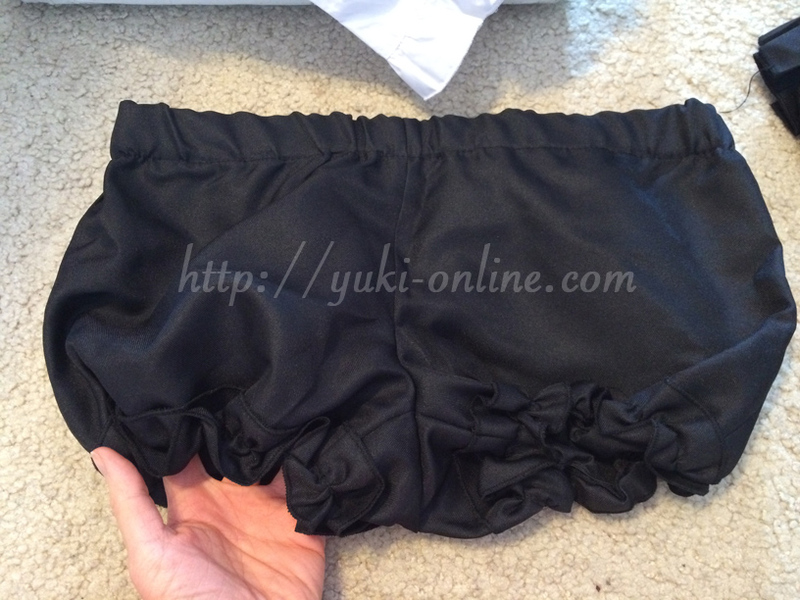 *I’m using watermarks because, except where noted, these are photos that I took specifically for this review. Warning: IMAGE-HEAVY POST. According to the email, this weighed 2.33 kg (5.14 lbs). 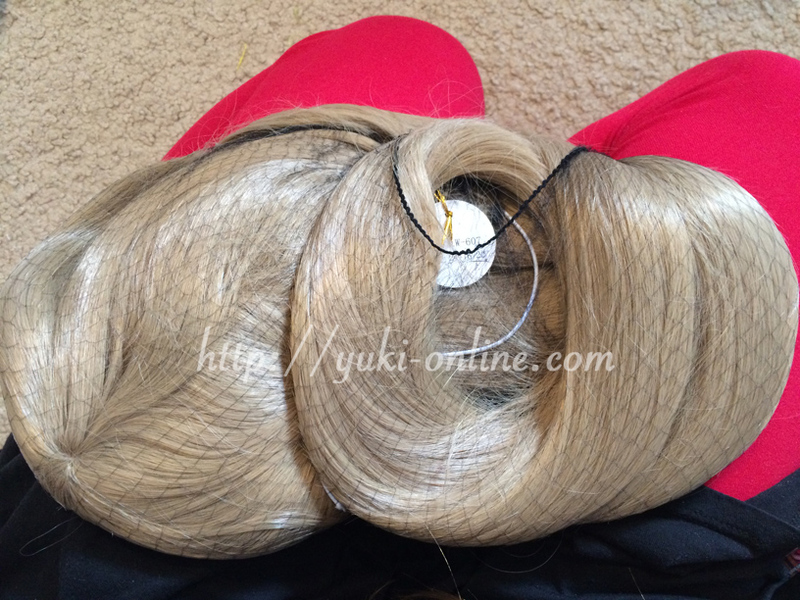 I feel like most of that weight comes from the wig… XD The box was taped all over the place, but that’s good! It was definitely secure. And this is what it looked like inside. I think it was packed pretty well–consolidated thoroughly! Everything was in bags, labeled with my name and names of each item I ordered (I think). I ordered three items total: a Kotori cosplay wig set, an Ayase Eli cosplay, and a Minami Kotori cosplay (both are their “Bokura wa Ima no Naka de” costumes). 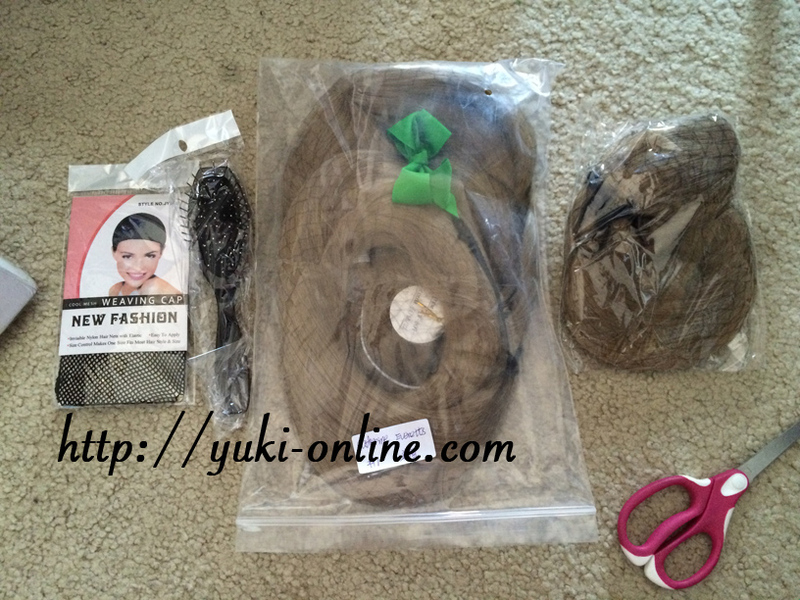 This is what’s inside the wig bag. I actually opened this last because I didn’t want to mess it up, but I’ll go ahead and show it first. 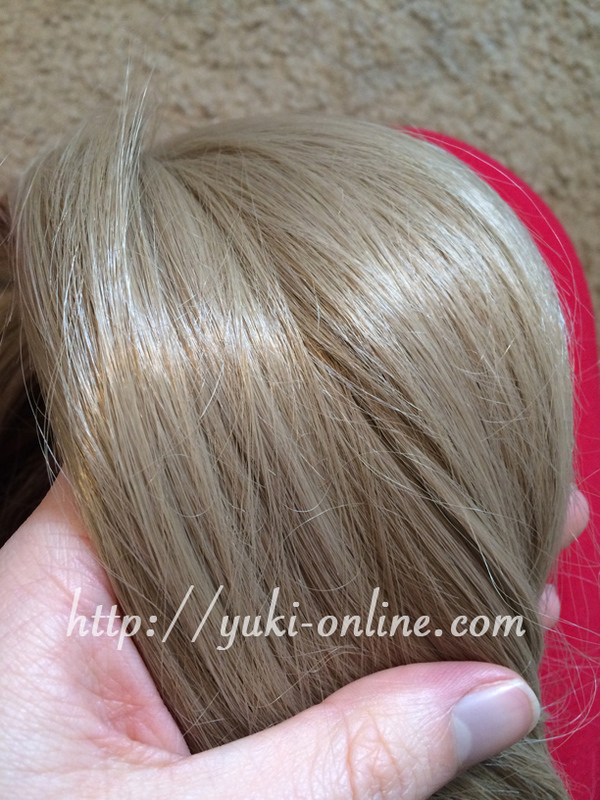 I’m really impressed with the texture of this wig–it feels soft instead of hard and plastic-y, and there isn’t much shine to it at all. Some strands did fall out of it, but I kind of expected that since it was the first time I’d taken it out of the package. Ironically, it’s virtually the same length as my natural hair. 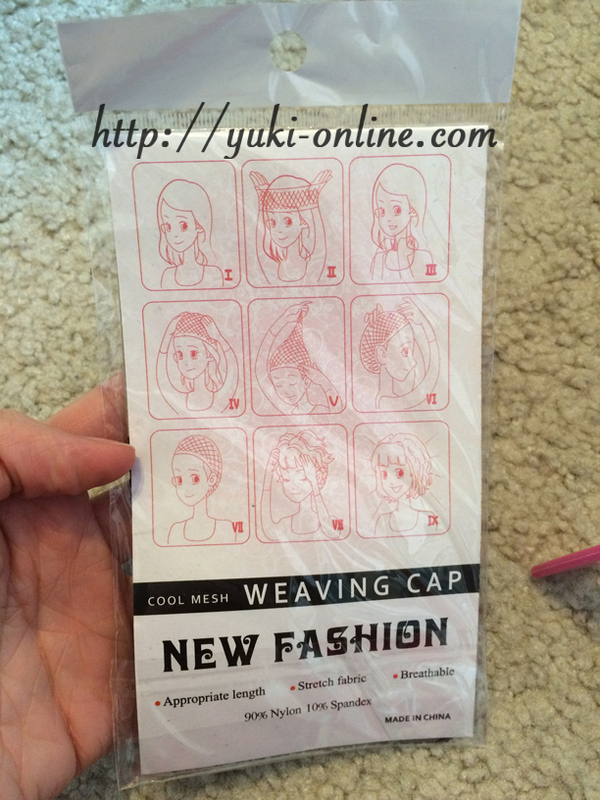 There are a lot of wefts, so it’s really thick, and I believe it is adjustable as well. 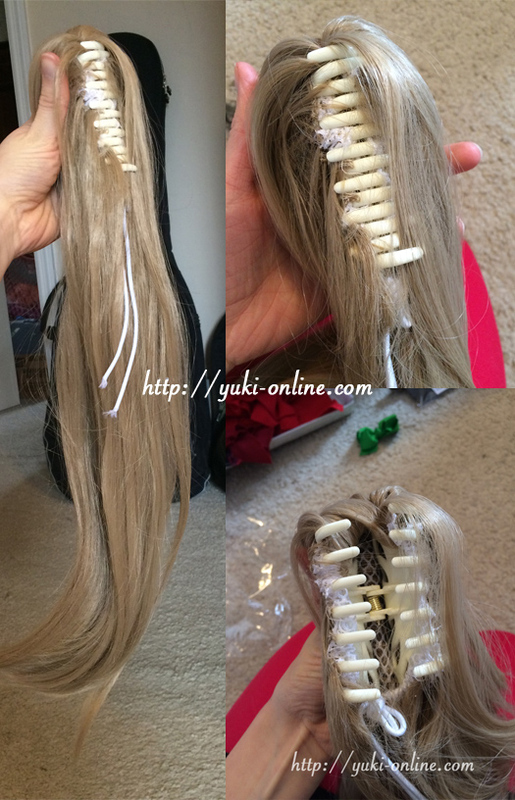 The extra piece clips onto the main wig. 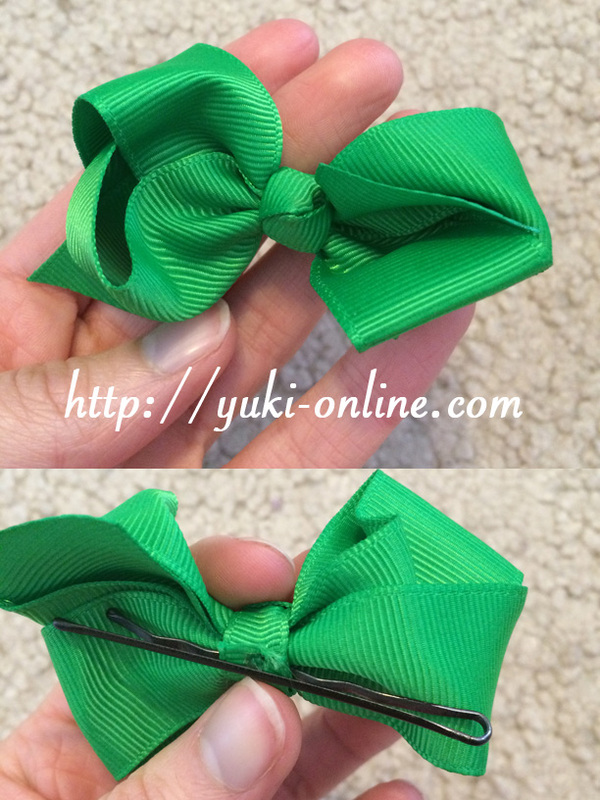 It came with Kotori’s usual green hairbow, which is, curiously enough, attached to a bobby pin. I expected it to be another clip. Voila! 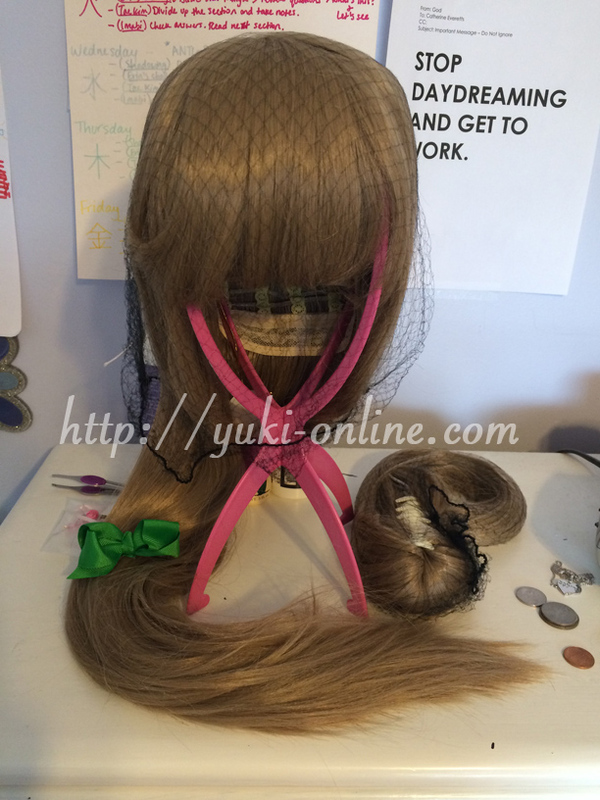 The wig on the wig stand. 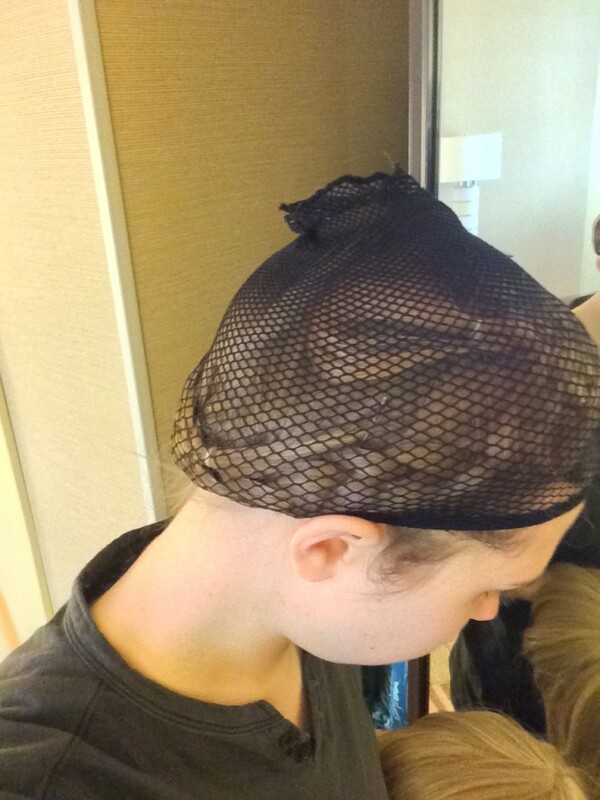 I put the net over it to keep it from getting tousled. You can see the wig stand underneath the cosplays. Now let’s look at it! One side is in Chinese and the other is in Korean. 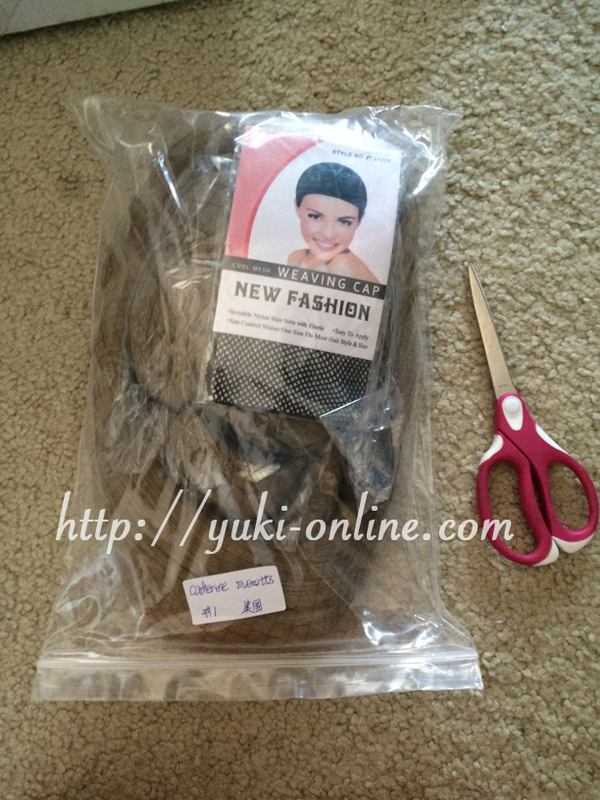 The bag contains three parts, which you have to put together yourself. Even if you can’t read Chinese or Korean, it’s really easy to assemble the wig stand going by the pictures and common sense. First, you put one half into the other (it only fits one way), and then fit the tops together. Then, you pop the ring on top and you’re done. ^o^ Easy! 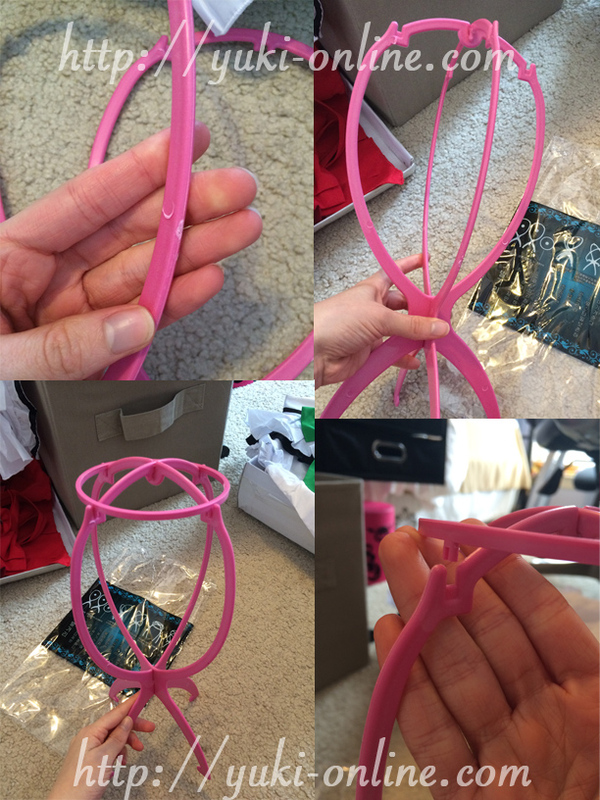 It’s obviously popped out of a mold (top left picture) and it’s not the highest-quality wig stand you’re going to find XD There is more evidence of this on one of the “legs” in the form of a slight discoloration, but it’s not too bad. The brush is also low-end quality with flecks of discolored parts underneath the glaze, but I wasn’t expecting too much from it so it’s okay, I guess. 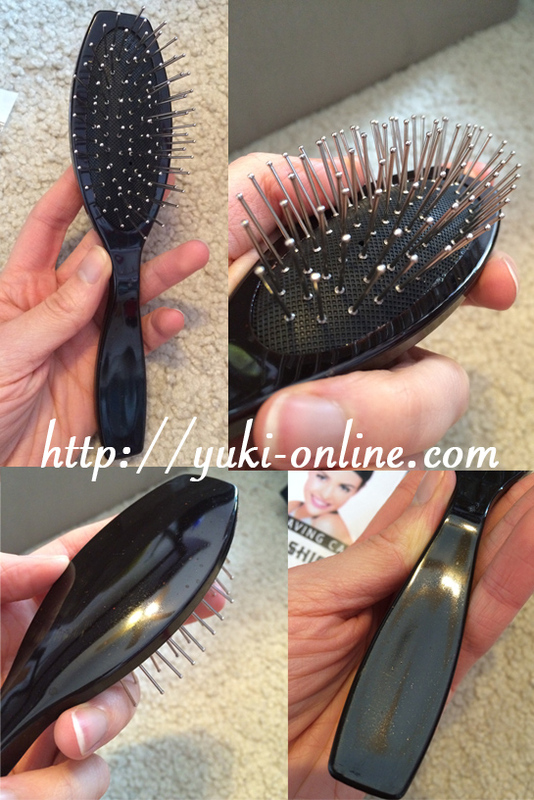 The brush head is rather heavy considering the small size of the entire brush. The instructions are just pictures, so it seems easy to understand. 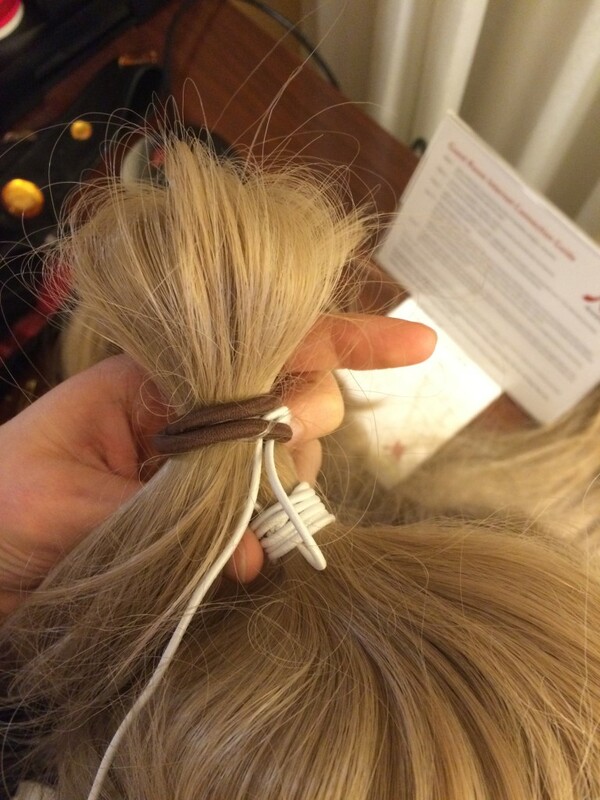 In the interest of time, and not wanting to mess up the wig too much, I left the original tie on, made a loop, and used one of my own hair bands to tie it so that the “tail” flipped over the other side of my [wig] bangs. (This picture was taken at the end of the day, after I took it off, so it’s rather mussed-looking.) 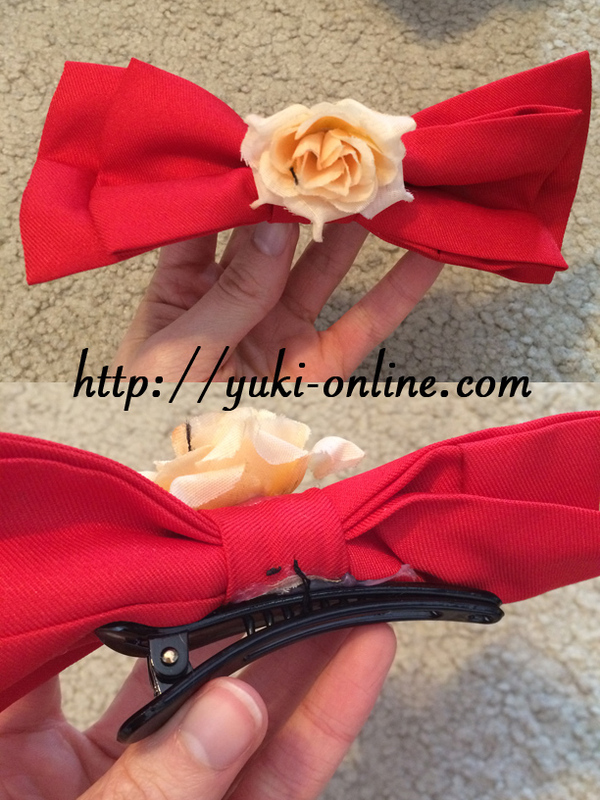 I clipped Kotori’s “Bokura wa Ima no Naka de” hairbow partially in front of and partially underneath the loop of hair in order to help support it. 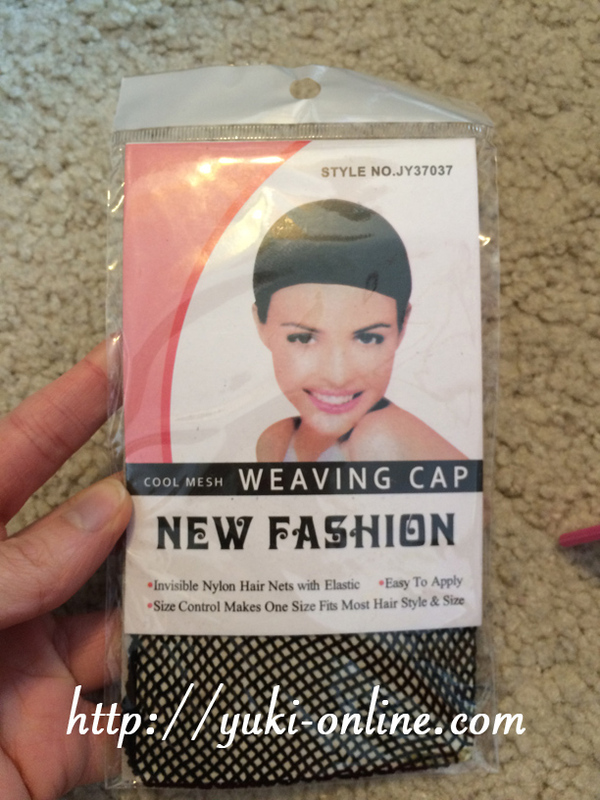 For the rest of the wig, I clipped the additional hairpiece on (it also helped support the “loop”) and bobby-pinned the wig cap to the hair net and my hair, as well as using more bobby pins to try to hold the flipped-over part of ponytail in place. When I got back home, I undid the tie (the white one you see in the picture) and smoothed out that section, so now everything is covered better. 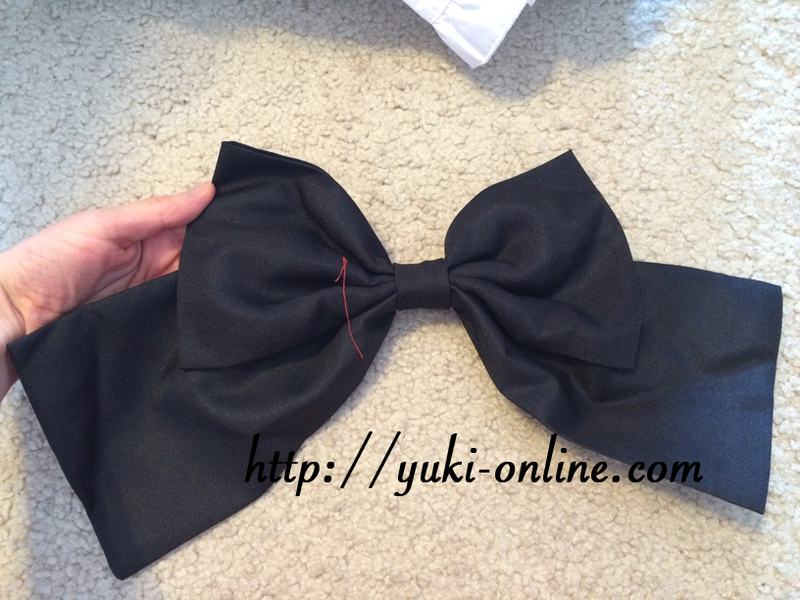 Next time, I want to try to make Kotori’s ponytail without using it. 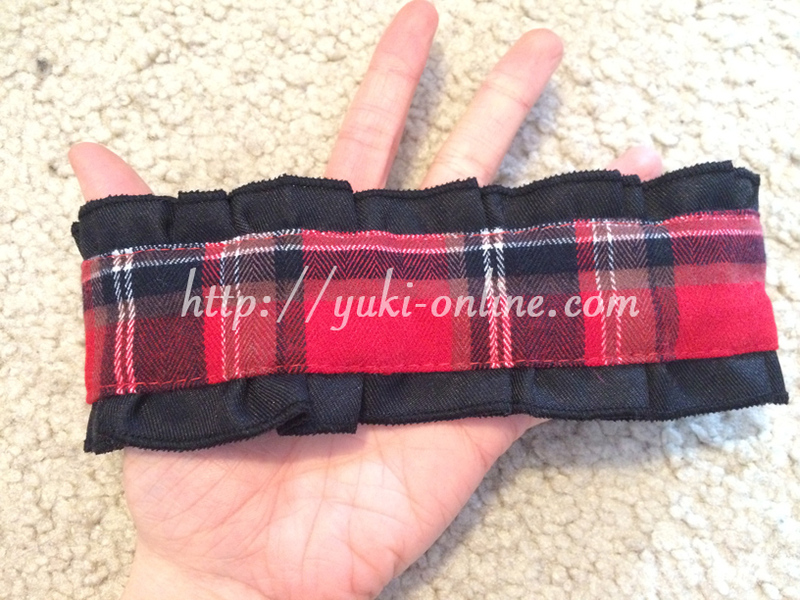 This is the garter that goes around one of Eli’s legs. 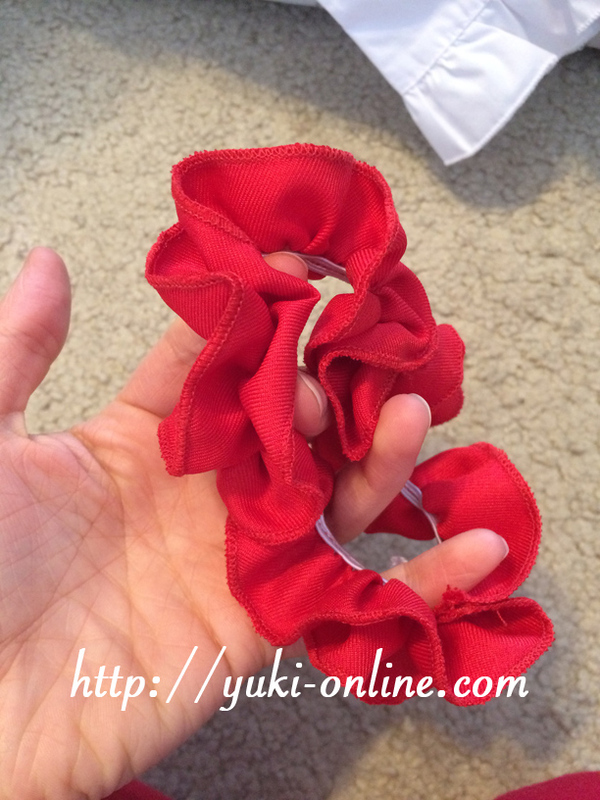 It was made basically like a scrunchie! Front of Eli’s shirt. 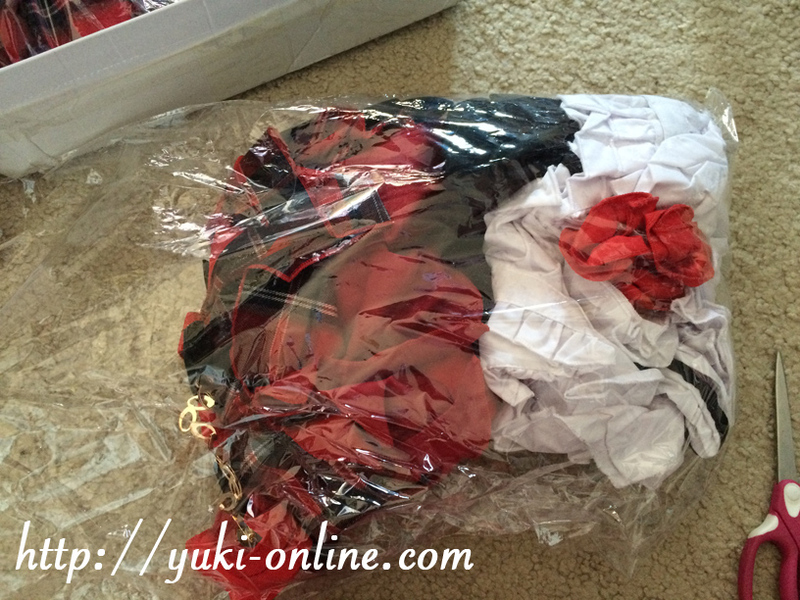 As you can see, it is quite wrinkled, but I expected that since it was already wrinkled when Taobaospree sent me the photos. The wrinkles disappear a bit when you put the top on though, because of the way it fits. 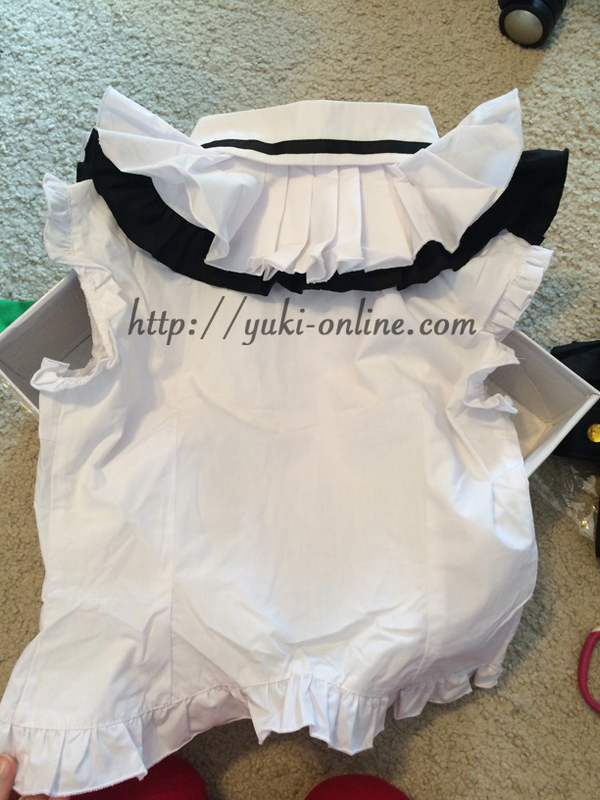 The ruffles are really nice and nothing is itchy~ It seems to be made out of cotton. 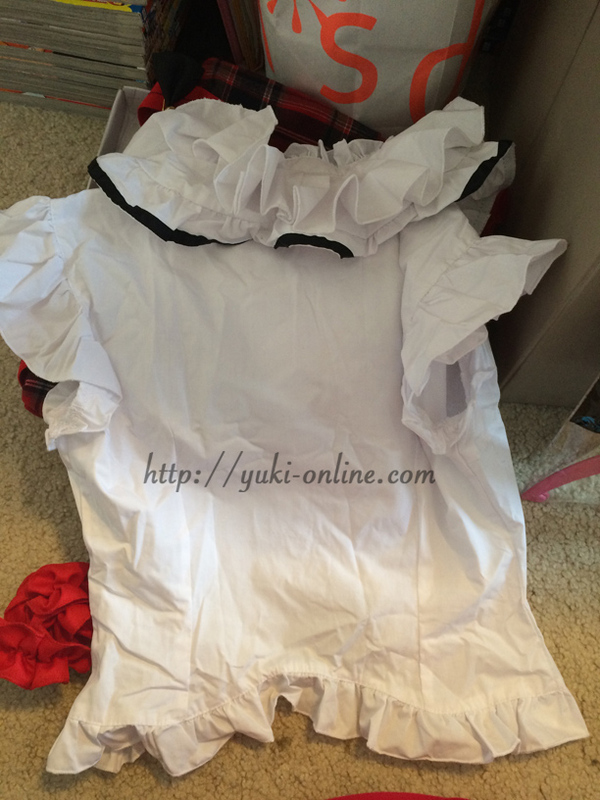 The back~ Wrinkly but a good job on the production. Eli’s pumpkin shorts! They are very stretchy. 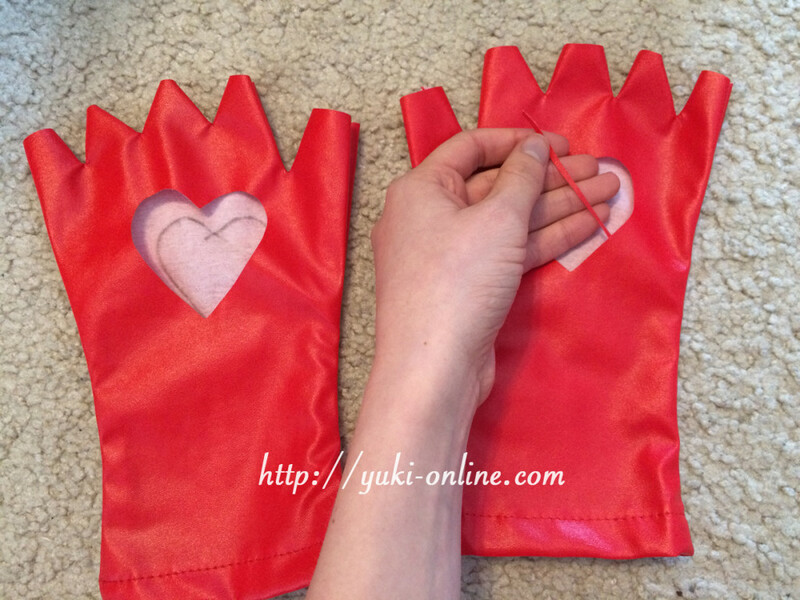 I was looking forward to these but unfortunately they are one of the negatives of this cosplay set. If you look closely at the stock images (seen in Kotori’s below), they are the same way. 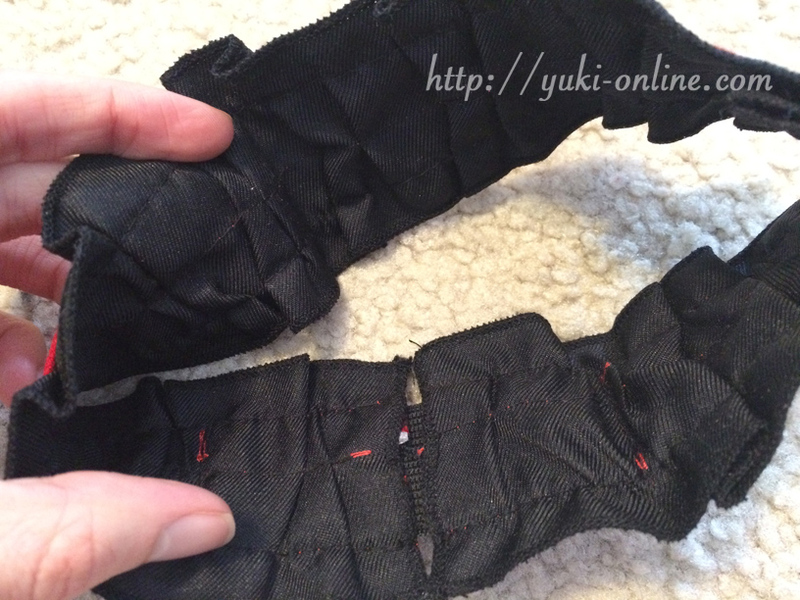 🙁 The material is nice and they are comfortable on the inside… But they were cut poorly and do not fit my hands (or my mom’s or my friend’s, for that matter). We will have to either make our own or go without. 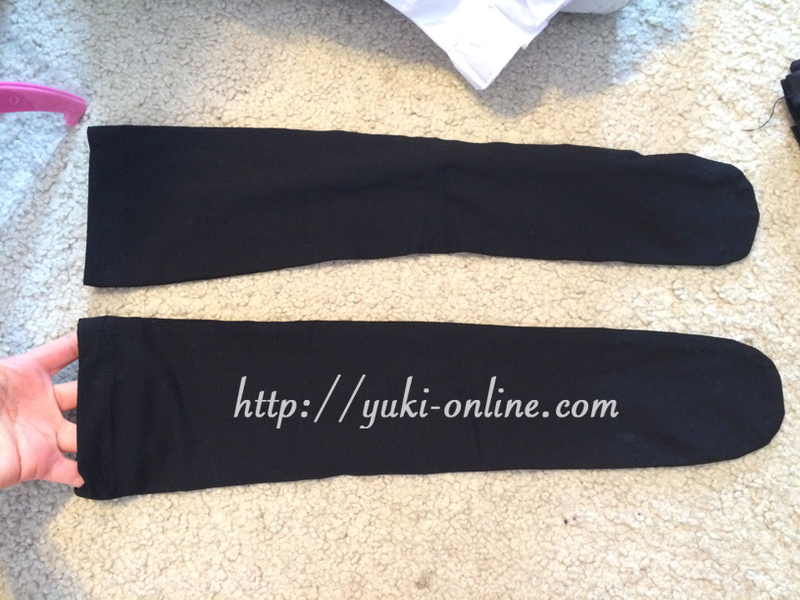 Eli’s socks are made from a fairly comfortable material that is probably polyester/spandex? 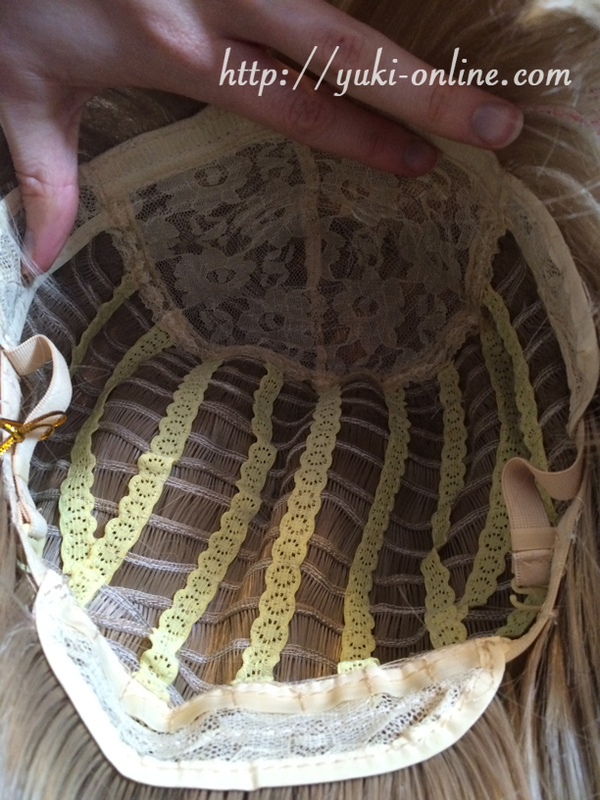 They are basically a tube stitched together at the bottom to form the toe end. They will come up higher or lower depending on the length of your foot and the size of your calves. 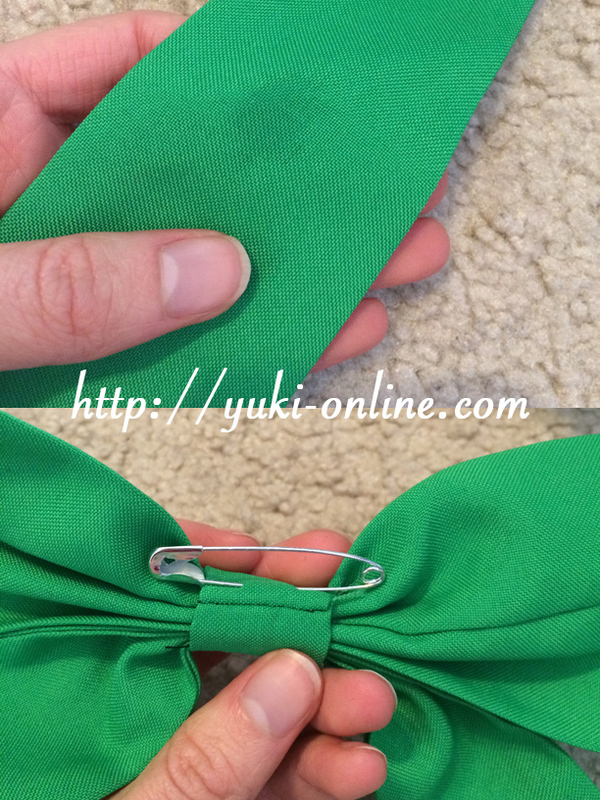 The bow is both sewn and glued onto the alligator clip. 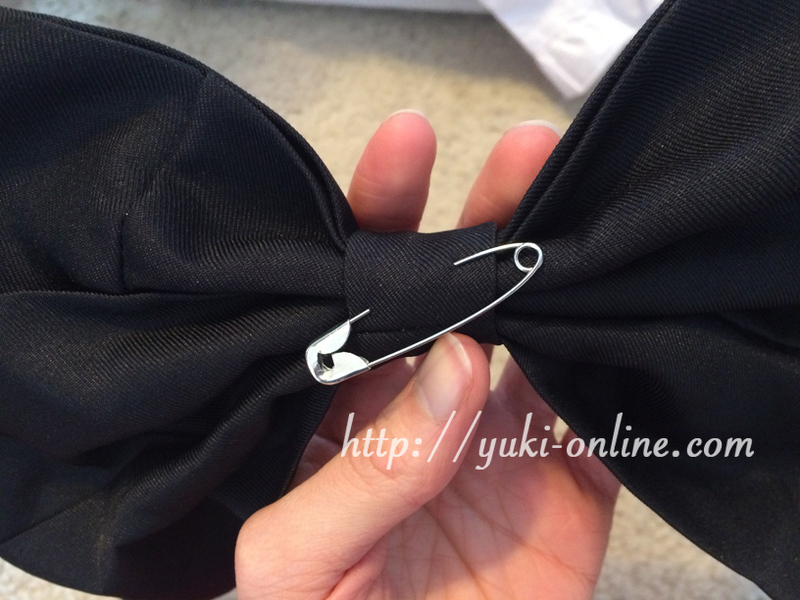 The bows on Eli’s skirt/suspenders are attached via safety pin. 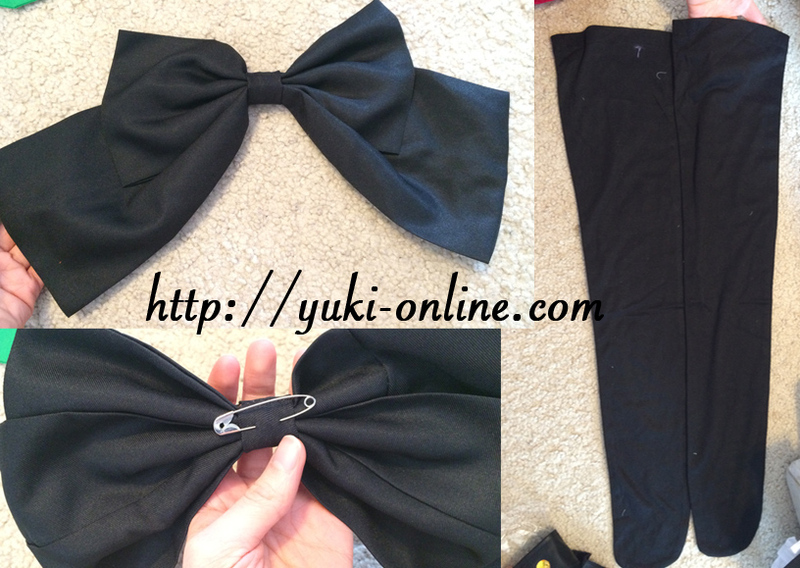 Kotori’s belt! I was afraid it wouldn’t fit me at first, but it actually has a lot of give and it’s super soft faux-leather. 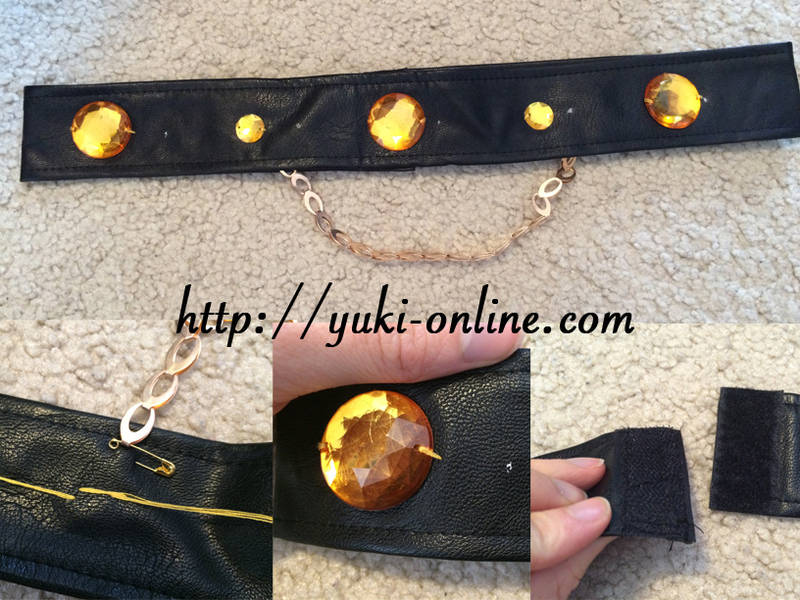 The chain, which is attached with safety pins, tends to want to kink up if it’s lying flat but it’s not as bad if it’s hanging (such as when you’re wearing it). The jewel things are obviously fake, of course, but they don’t look bad. I’m not sure why there are white marks in between each one, though. Maybe the jewels were supposed to go there but they got sewn off to the side? 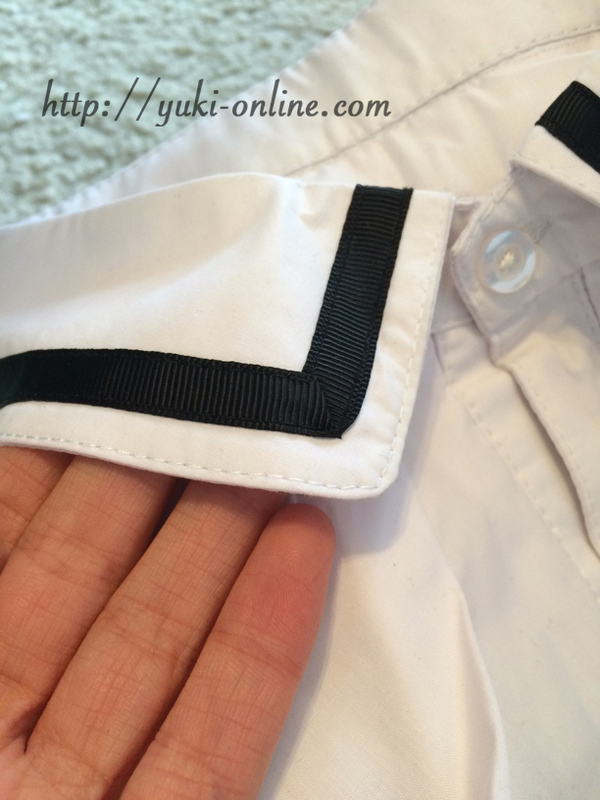 Kotori’s shirt is also pretty wrinkled (lol). The design is different–the sleeves are just barely there, whereas Eli’s shirt’s design has large ruffles flaring out from the shoulders. 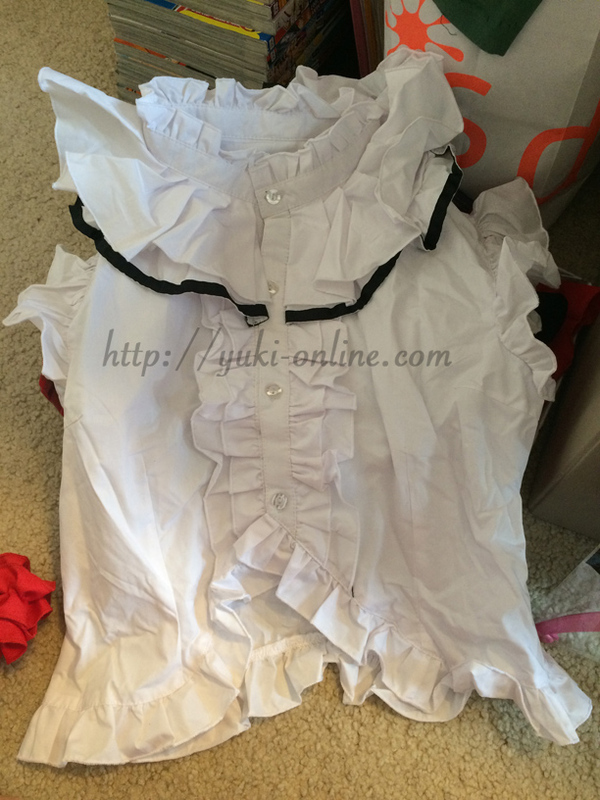 Again, this is a good-quality shirt, probably made from cotton. 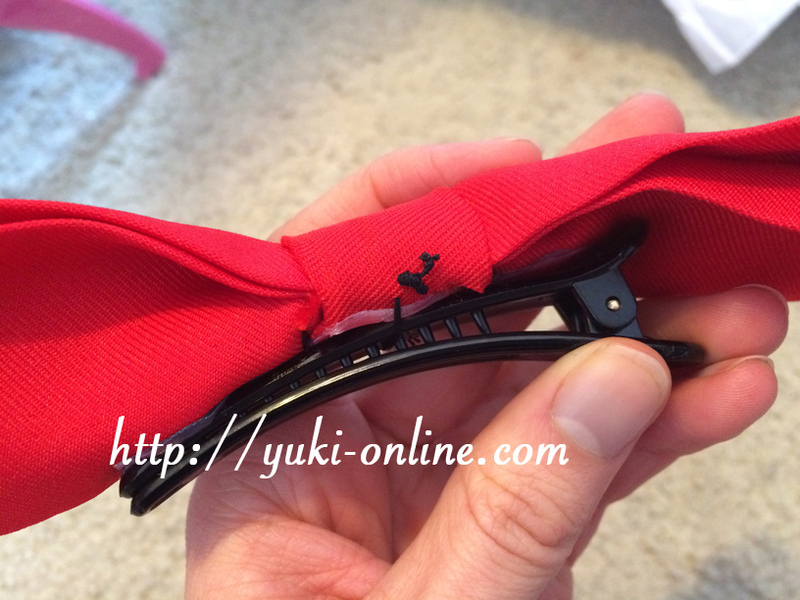 The collar is sturdy and has black ribbon for trim. I put it higher up on my leg than you’re supposed to so that I could show how the elastic band works. 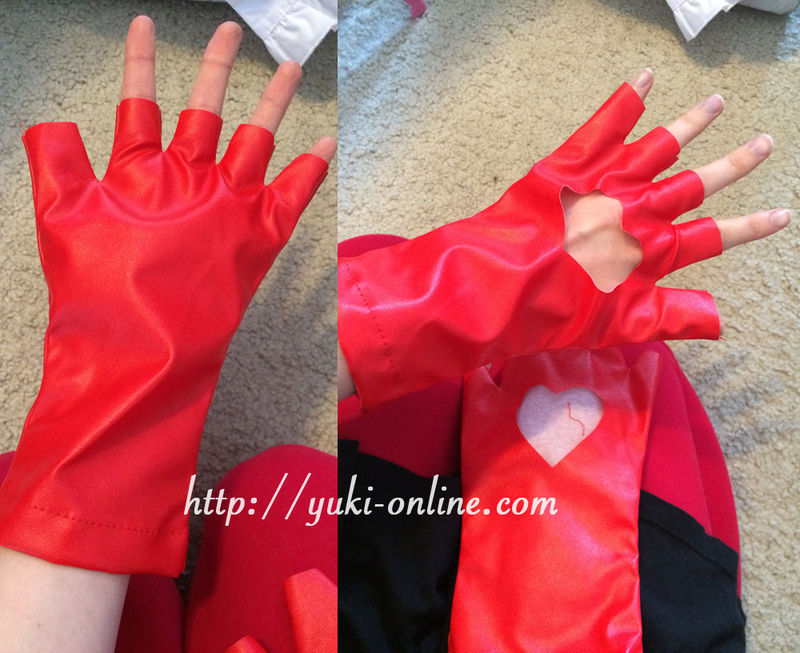 Sadly, Kotori’s gloves are the same as Eli’s–poorly cut. 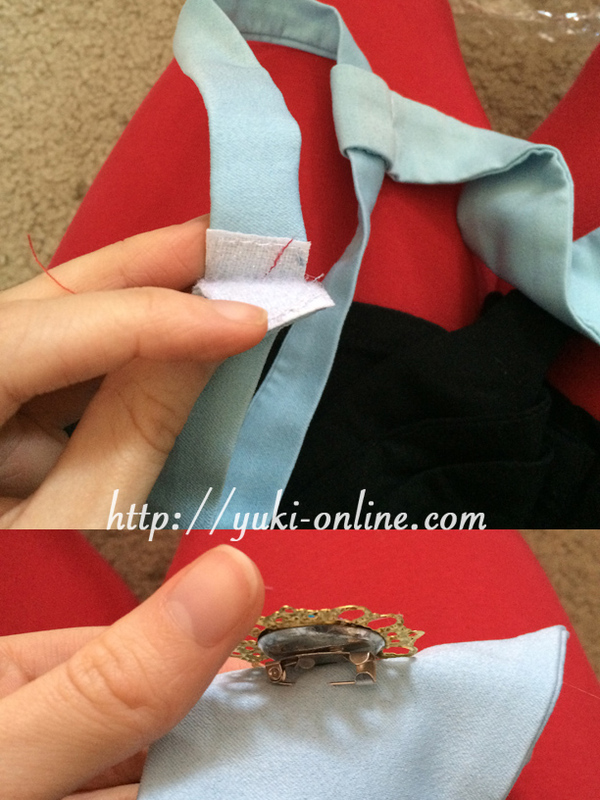 There was a loose piece of fabric stuck inside one. 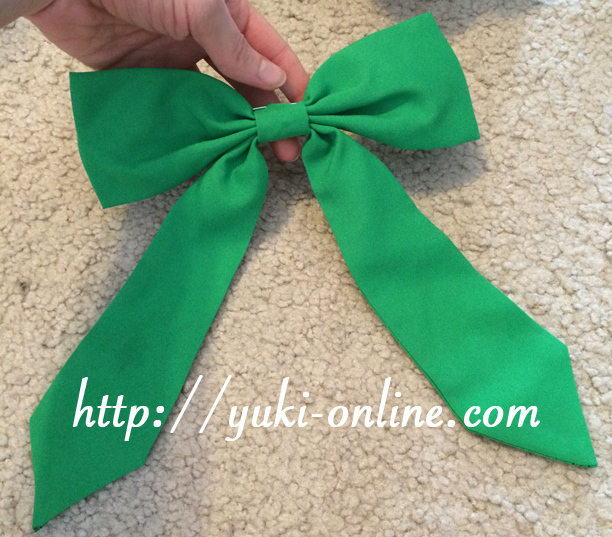 Kotori’s bow and socks are the same as Eli’s, except Kotori’s socks are longer. 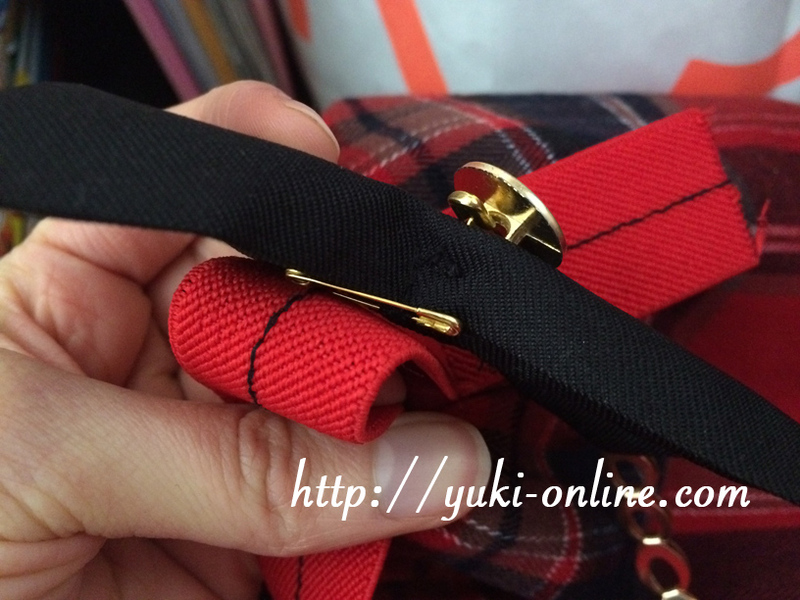 Kotori’s buttons are sewn onto the suspenders. 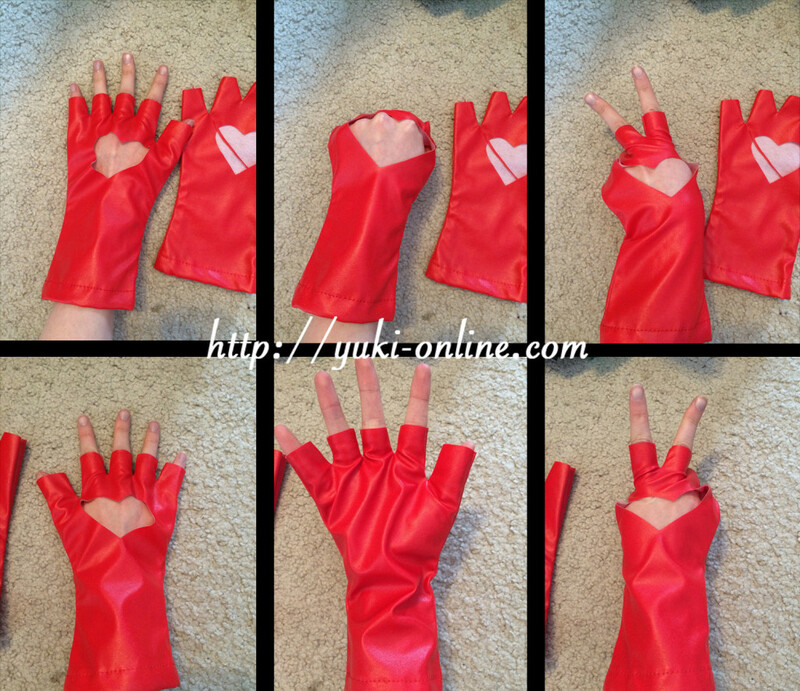 Testing out cosplay time! My mom as Eli. 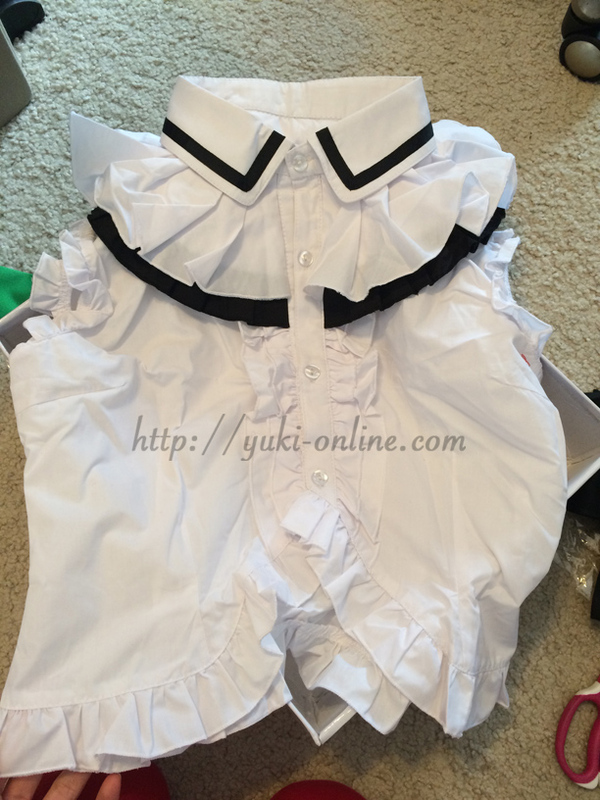 Posted in Blog, ReviewsTagged ayase eli, bokura wa ima no naka de, cosplay, haul, love live, lovelive, minami kotori, order, review, school idol project, taobao, taobaospree, wigLeave a Comment on Taobao Cosplay Haul & Review – Minami Kotori and Ayase Eli from Love Live!